While many elementary and high schools have banned cell phones, at least one university has made them mandatory in the name of safety. Montclair State University requires “Full-Time Freshmen and Transfers” to have a cellphone from the institution’s chosen provider, Rave Wireless Services. The WCBS article and video linked to above quote a price of $420 a year which includes “just 50 peak voice minutes a month, but unlimited text messaging to any carrier, unlimited campus-based data usage, and student activated emergency GPS tracking.” The newer reports focus on the GPS device tracking capability as a safety feature. So some students who matriculate to Montclair will be coming from schools where they’ve been told that their phones are dangerous distractions to a new institution that proclaims cell phones to be so important to students’ safety that they are mandatory. I know that the situation is much more complicated: colleges and universities are much larger, have many more students, and have more mature students. But the apparent contradiction seems pretty confusing. I suspect that the simple, uncomplicated (and thus wrong) messages each side has attempted to portray (“They’re evil distractions!” “No, they’re necessary safety devices!”) is the root cause of this apparent contradiction. It’s very easy for those of us who work in higher education to ignore or merely be ignorant of what our counterparts in elementary and high schools are doing. Those of us who study college students (a pseudo-discipline we have labeled “student development”) very easily and quite often fall into the trap that everything important that happens to people happens between the time they step foot on campus and leave campus after graduation. But our students come to us shaped by their experiences throughout primary school, secondary school, and other life experiences. How damaging is it to all of education and all educators when we contradict one another (“Social Networking Services are bad!” “No, they’re good!”) without attempting to resolve or explain those apparent contradictions? And how confused and disillusioned do we make our students? A special issue of the Journal for Computer-Mediated Communication (JCMC) focused on SNS edited by danah boyd and Nicole Ellison has finally been published. All of the articles are available online for free. Of particular interest to me are “Social Network Sites: Definition, History, and Scholarship” by danah boyd and Nicole Ellison and “Whose Space? Differences Among Users and Non-Users of Social Network Sites” by Eszter Hargittai. Hats off to danah and Nicole for pulling this together and seeing the project through to completion! The Online Computer Library Center, better known as OCLC, released the 280-page document “Sharing, Privacy, and Trust in Our Networked World.” Although the report focuses in part on libraries and library directors, it also includes significant sections on (a) User practices and preferences on their favorite social spaces, (b) User attitudes about sharing and receiving information on social spaces, commercial sites, and library sites, and (c) Information privacy: what matters and what doesnâ€™t. The research appears to be largely based on surveys of several thousand individuals from Canada, France, Germany, Japan, the United Kingdom and the United States. The European Network and Information Security Agency (ENISA) released the 36-page document “Security Issues and Recommendations for Online Social Networks” (1.8 MB pdf). Contributors to this document include many familiar names for those who have browsed my bibliography: Alessandro Acquisti, Fred Stutzman, Nicole Ellison, and Ralph Gross, among others. While the focus of this document (threats and recommendations) may be slightly different than that of interest to many of you, the perspective is very valuable and many of the issues identified will be familiar. Among the issues addressed are: difficulty of complete account deletion, SNS spam, profile-squatting and reputation slander through ID theft, stalking, and bullying. Karine Joly discusses a new Facebook feature, Facebook Pages, in the context of institutions of higher education seeking to market their institutions and connect with their constituents. Although intended primarily for commercial marketing purposes, Joly sees utility in this tool for higher education. Personally, I am becoming wary and weary of marketing efforts, particularly as they continue to infiltrate our personal lives and spaces. I recognize that much of that infiltration is occurring simply due to the blurring of boundaries between our personal and private lives but that does not make my any more comfortable with some of these developments.Â Nor am I comfortable with the commercialization of higher education despite my understanding of the economic and social forces driving it. I have a brief article in the current issue of Leadership Exchange, NASPA’s quarterly magazine for senior student affairs officers. The article is entitled “The Offline Challenges of Online Video” (which is a much better title than the one I had for it) and it’s in the Technology Center section. NASPA members can access entire volumes of Leadership Exchange via the NASPA website after logging in. For those who are not NASPA members, here is the article as it was submitted to the editor; it was substantially shortened and the references removed as befitting the type of publication and audience. We were hoping the article would serve as a small promotional or awareness piece for the NASPA Technology Knowledge Community but I think that link got lost in the editorial process.Â It’s also worth noting that the article was written before the University of Florida “Don’t taze me bro!” incident that was captured and spread via YouTube. M. Leslie Sadle discusses Facebook in a NASPA NetResults article entitled “Freedom and Responsibility: Teaching Critical Thinking Skills to Facebook Users.” The article is available to NASPA member. If enough people express interest to the author, perhaps he or she will release it in a publicly-available location (when I last published a NetResults article, I was not asked to sign over copyright to NASPA). David M. Eberhardt also discusses Facebook in “Facing up to Facebook” in the current issue of AboutCampus. It’s an ACPA publication that is mailed to all ACPA members and I don’t know if it’s available online. Lawsuits against college and university students accused of downloading or sharing mp3s continue and institutions continue to ratchet up the stakes for students accused of copyright infringement. Are institutions really getting more strict about this issue or are those who are instituting harsh punishments simply the ones who attract the media reports? And are they doing it in part to attract those media reports (“Look, we’re trying to do something about this! Didn’t you read about it in the newspaper?”)? Meanwhile, on the opposite side of the issue from the MPAA, the EFF has released a report entitled “RIAA v. the People: Four Years Later” (pdf file). Universities and colleges have often (and rightly) complained that most of the congressional attention regarding copyright infringement has unfairly focused on them. No worries. Some in Congress are eager to attempt to do foolish things to regular Internet Service Providers, too. One of the threads in our recent discussion regarding Facebook advertisements has focused on a shared desire to more accurately target Facebook users. Either we’re starting to see progress on this front or there were developments of which we were previously unaware (likely both). Not only are there applications built to specifically address this issue, Facebook is working to build this into their own ad system. A few months ago, Valleywag posted a brief discussion of the supposedly dismal clickthrough rate of Facebook flyers: .04%. Clicktrough rate is a measure of the percentage of viewers/visitors that click on a particular ad or link and a .04% rate is indeed miserably low by most measures. For some reason, this discussion was noticed and discussed by a few more folks last month, including Fred Stutzman. As is often the case with “research” discussed online, the methodology and other important details are not discussed in sufficient detail to evaluate the usefulness, applicability, and rigor of the research. In particular, I would like to know more about exactly what was being advertised. I would like to know this because I assert that services, items, and events advertised by colleges and universities differ significantly from those advertised by others. I would hope that not only would we know our students better than others but we also would be advertising things of particular interest to our students. I recommend that institutions making use of Facebook flyers ensure that those using the flyers coordinate or, at a minimum, communicate amongst themselves. Not only are there the usual issues of consistency of message, appropriateness of tone, proper use of institutional marks (logos, graphics, etc. ), and the other issues related to mass media advertising but a lack of communication may lower the effectiveness of the medium. In other words, if every department and student organization on campus is posting Facebook flyers with no quality control then students may simply phase them out much like they have e-mail spam and banner advertisements on webpages. I do not intend to make that (getting heterogenous groups to communicate or coordinate, particularly student organizations) sound easy and I suspect that on many campuses the “watering down” of Facebook flyers is already happening. However, I don’t know if many institutions would allow departments to advertise via mass media to every student and alumnus without any guidelines, approval, or minimal levels of communication and coordination. Before I left Sewanee, we used Facebook flyers as part of our marketing campaign to advertise our Residential Computer Consultant (RCC) student employee openings. The campaign was a success despite the significant increases in the application requirements. We made many changes to our advertising process so it’s impossible to tell if the Facebook flyers played a huge role in the campaign but we did receive several positive comments from those students whom we interviewed, particularly those who were applying for the marketing/education position. Several of the students seemed to view our use of the flyers as indicative of our knowledge of and commitment to student culture and practices and at least one student liked that we had launched a coordinated campaign spanning multiple media. We did not measure the clickthrough rate but our impression was that the flyers were well worth their very low cost. We also noticed one minor issue: my default Firefox settings with the AdBlock Plus plugin blocked the image we used on our flyer. If we had elected to host the image ourselves, this issue would have been avoided (and we could have also used the stats thus generated by our server hosting the image). We did not troubleshoot this extensively so I do not know if this problem is widespread. Posted on July 18, 2007 Categories Social Networking Services8 Comments on Facebook Flyers Worth It? The room in which I will be presenting my Social Networking Services Professional Development Seminar (PDS) session tomorrow at the ResNet Symposium is less than perfect. To assist the attendees, I have made the presentation available here (minus the videos) so they can follow along on their own monitors. I’ll post a proper follow-up to the PDS later tomorrow reflecting on lessons learned and interesting observations. Update: I will not be posing a proper follow-up to my PDS session except to say that I very much enjoyed the experience and I think it was very well received. I greatly enjoyed and appreciated the interaction with and feedback from the participants. Other than that, I don’t know what else to say that would be appropriate to post in a public venue. I’ll provide an update once the class materials are uploaded and the video made available. We’ve seen and are continuing to see attempts by state and federal legislators to restrict the use of social networking sites like Facebook and MySpace on computers with Internet access funded by the (state or federal) government. Although DOPA was not passed into law last year, Sen. Stevens introduced a similar law earlier this year. State legislators in Connecticut and Illinois have introduced similar legislation. For some of the proposed bills, requiring that the users supply proof of their age and secure parental permission for minors to participate would satisfy the legislative requirements. That seems like a low bar for colleges and universities, particularly if the users are those who have already applied to the institution and thus already supplied proof of age; it’s only one more bullet point on the application form signed by the applicant and, if necessary, mom or dad. Of course, this completely dodges the question of how the laws would actually be enforced in libraries and schools, how easy it will be to overcome the necessary technological filters and restrictions, what evidence would be necessary for librarians or teachers to allow minors to access social networking sites, etc. The primary concern of many who perform research into youths’ use of social networking sites is the disparate impact this legislation would have on youths whose primary Internet access occurs at school or the library. That concern should hold true for college and university administrators as this proposed legislation would have a negative and disproportionate impact on prospective students with a low SES. It seems to me that this legislation may strengthen continued concerns about the widening SES gap in America between those attend college and those who do not. Further, this proposed legislation may harm efforts to attract students with low SES and help them fit into the college environment in that crucial first year. Colleges and universities must monitor this area of legislation. Not only does it impact current and developing programs such as online orientation programs and cutting edge recruiting efforts, it may intertwine with the continued debates about widening SES gaps and efforts to shrink those gaps. There are many academically interesting aspects of the uses to which online tools are being put as students and professionals struggle to make meaning of the recent tragedy at Virginia Tech. Communicate with one another. This use was most visible and common during and immediately after the shootings as students updated their online profiles to let others know they were alive (I almost typed “okay” but that is clearly the wrong word). Publicly grieve and memorialize the slain. Others have discussed this usage of social networking sites; some time ago, Facebook apparently had to modify their policies to take into account this unexpected behavior. Make meaning of these events. Of course, this use is intimately tied to and intertwined with the previous use. Let’s take a closer look at the most obvious example of this search for meaning using online social networking tools: the rapid development of the Wikipedia article. The article was initially created at 10:16 on Monday morning and has rapidly grown since. As of 20:58 CDT on Thursday evening there have been over 6300 edits to the article with each edit occurring 47 seconds apart on average. 1865 different editors have edited the article; 507 of those editors were anonymous, unregistered editors. A quick and thoroughly unscientific review of the edits seems to indicate that just over 10% of the edits, around 650 or so, were acts of vandalism or removal of vandalism. Our interest lies in how people are using this collaboratively created encyclopedia article in the search for meaning. First, it’s important to remember that like everything else, these actions are taking place in a particular context. In this case, the context is that of a collaboration that aspires to create encyclopedia articles. For those who are unfamiliar with the inner workings of Wikipedia, suffice it to say that the scale, nature, and goals of the projects have led to the development of a maze of rules, policies, guidelines, cultural norms, and formal and informal expectations of user behavior and product quality. Examples of these forces include Civility, Neutral Point of View, No Original Research, and Verifiability. But even within those bounds users have great latitude in constructing articles, particularly brand new articles. The most visible and easily traced activity is the process by which the name of the article was decided, challenged, and changed (several times). Even with the guidance of the Wikipedia Manual of Style, there were still many minor decisions to make about the title regarding the possible inclusion of the year “2007,” word order, capitalization, etc. However, the major decision was to use the word “shooting” or “massacre” to describe the events. Although the decision to adopt “massacre” was ostensibly made as a reflection of the media coverage (the “common name“), many of the initial (and ongoing; very few things are ever settled or beyond debate and discussion in Wikipedia) arguments were clearly subjective judgments about the unfolding events and details. The choice of details to include or exclude in the article also reflect not only Wikipedia policies but the judgment of more than 1300 individual editors. Wikipedia’s notability guidelines provide some guidance but the ultimate decisions lie with those editors. For example, do the questions and arguments about gun control raised by this tragedy belong in this article? What about the various offers of assistance from other universities – if only some of them are to be included (as it would be impossible to include them all), which ones are “notable” enough to make the cut? What about the victims – are they inherently notable and should they each have their own article? Or would such articles be memorials and thus unenyclopedic (many editors argue that “Wikipedia is not a memorial.”)? How can we place these events into historical context? Do we rank school shootings and tragedies or is a historical comparison inappropriate and impossible? And how many of these issues can and should we decide right now given the incomplete facts and high emotions? Many of these questions are clearly fundamental questions in making meaning of these events, even if they are wrapped in the guise of creating an encyclopedia article and guided by Wikipedia rules and customs. Although such expressions are understandable and a natural part of the grieving process, I am a bit concerned about the permanent nature of the electronic media being used to document negative but (hopefully!) temporary emotions. Given that these records are publicly accessible, archivable, replicable, and searchable, I hope that others who view these groups and other similar expressions of negative emotion (including the members themselves) will keep in mind these factors that make transient expressions of emotion take on a permanent nature in this context (and when removed from this context). That’s classy, huh? 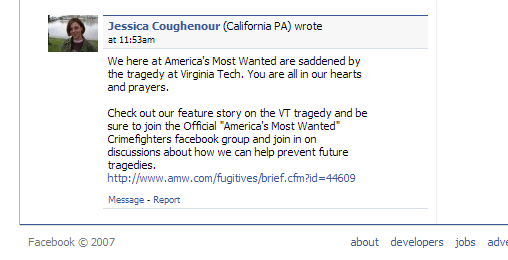 At least she’s not trying to directly profit from this tragedy like these scum. Let’s end on a positive note. Like others, I deal with tragedy by trying to learn from it. Karine Joly evidently feels the same way because she has been writing about the lessons administrators, particularly those in communications, can learn from these events. It’s probably a bit too early for some to step back from these events to objectively analyze our reactions to learn from them. But when you’re ready, Karine’s got some good advice to share. After attending so many sessions about and related to Facebook at last week’s ACPA/NASPA Joint Meeting, I’m a bit burned out on the topic and trying to take a break from it. However, I’m teaching/facilitating a 3-hour session on social networking this summer at the ResNet Symposium so I can’t afford to get away from the topic for too long. Attorneys Sheldon Steinbach and Lynn Deavers shared their legally-informed thoughts about university policies about and related to Facebook, MySpace, and other sites at InsideHigherEd. Their analysis is thoughtful and offers a critical insight into some of the legal considerations that may escape or elude non-lawyers. In particular, some of their analysis focuses on the legal concept of the “duty of care” that is established when a published policy is specific enough to establish expectations on the part of campus constituents. Fred Stutzman once again shares his views and advice for higher education. If you haven’t read Stutzman’s works, you should; some of it is specifically aimed at educators. An article written by Karine Joly in the current issue of University Business discusses social networking tools and the various uses to which institutions are putting those tools. The anecdotes and examples are particularly interesting and should give you food for thought. An article in Knowledge@Wharton (free registration required – sorry!) not only discusses some of the basic issues surrounding Facebook and other social networking sites but also the long-term viability of these sites and the issue of exclusive membership and the role of membership. This discussion is particularly relevant for those who have created or are considering creating their own site with limited or exclusive membership; some institutions have already done so with success.